Captains, gather a team and make your entry for a date in August. 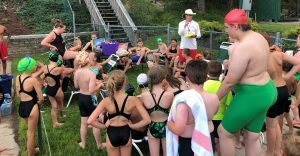 Event insights and outreach efforts for getting your friends and contacts to join us at the pool, as a team, are explained here. Share the fun and excitement of community interactions at Pittsburgh’s Ammon Pool and its multi-day, water-safety event and SKWIM Tournament, as it is for everyone. Get your group to show up for one day. Pick a date that works best for you and your cadre between August 6 to 16th. Public calendar, https://CLOH.org/calendar. Once you’ve enjoyed the experience and crave more, return for another session. Individual sign-ups are okay. Plus, we can plan additional group events for the future on Saturdays. Participants, activities are for everyone. Ammon’s water safety events are inter-generational (for both kids and adults). SKWIM play unfolds with players of all ages and sizes. 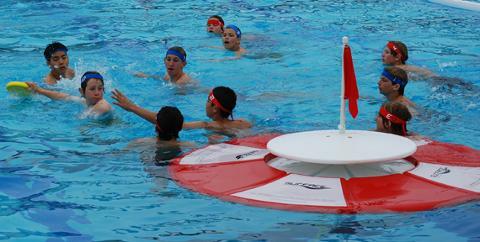 First-time players can still be proficient in SKWIM games. Everyone helps in the team play. SKWIM skills and rules are easy. We’ll all have fun. Trust that most of the other players are going to be first-time participants as well. Pool patrons can participate in the games without any extra fees and charges. Participants pay their an entry fee at the gate if they do not already have a Citiparks’ pool tag. Bring or wear a swim suit. Have a towel. Leave valuables at home or in the car. The disks, fins, goals, boundaries and headbands are all provided. Water polo balls and water polo caps, as well as underwater hockey equipment (sticks and a puck) are all available. In the pre-game clinic, everyone gets to try-out the SKWIM fins. Bring their own fins if you have them. Wearing fins is optional. Round, floating, premiere SKWIM goals are defended by goalies on defense. The goals are used at Ammon. The goal’s parts include a ramp, trap, basin, top and flag. Premiere, island, floating SKWIM goals reside at Ammon in August and are used to create a lagoon for events in the pool area that is 3-to-4-foot deep. The SKWIM boundary system can be used for competitive swim teams, looking to play the SKWIM Ultimate in deeper water of 5 feet. Sessions last 2-hours or less, 3:30 to 5:30 pm. Coach Mark leads a mini-clinic and lesson after introductions. 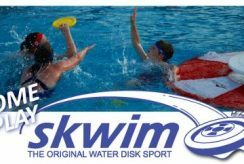 First 30-minutes, 3:30 to 4 pm: Pool arrival, gate entry with payment, introductions, paperwork / photo release checking, fin fitting, game explanations, warm-up swim, disk passing. A teamwork and sportsmanship chat ends pre-game efforts. First game, 4 to 4:30 pm: Red squad vs. Blue squad. White squad can free swim. Second game, 4:30 to 5 pm: Winner of game 1 vs. White squad. Other squad can recover and free swim. Wrap up for squad that played both games. Third game, 5 to 5:30 pm. Loser of game 1 vs. White squad. Other squad that has just played the two prior games can either free swim or depart. By 5:30 pm, all can depart or stay and free swim. With demand, different sessions could be secheduled from 6 to 7:30 pm. When do you want your team to play? What date works best for you and your friends? Events span multiple days, but each team only needs to play ONE day. This is a simple, one-time commitment. Each team gets a clinic and two games in one visit. The aim is to have three teams present for pool play in a round-robin tournament every session. Tip: Get the date you desire. If the RED Squad is claimed, then check the availability of that date for the BLUE Squad. Reserve your date and time slot on the web application, NeedToMeet. However, if you have difficulty, call, text or email Coach Mark. Dates and times can be reserved for your squad by the administrator and be reflected in the calendar. Coach Mark can run a simple poll for you with Need To Meet if you contact him and provide your email list. Work with Coach Mark to quickly execute a poll so your people can choose what date works best for them and if your team can assemble enough players at specific dates and times. NeedToMeet is a nifty web application that can send out an email and solicit replies. Your contact list of emails is safe with Coach Mark. Use the form on the home page or else send an email to Mark@Rauterkus.com. After your date and time is obtained, let’s get your players to the pool. 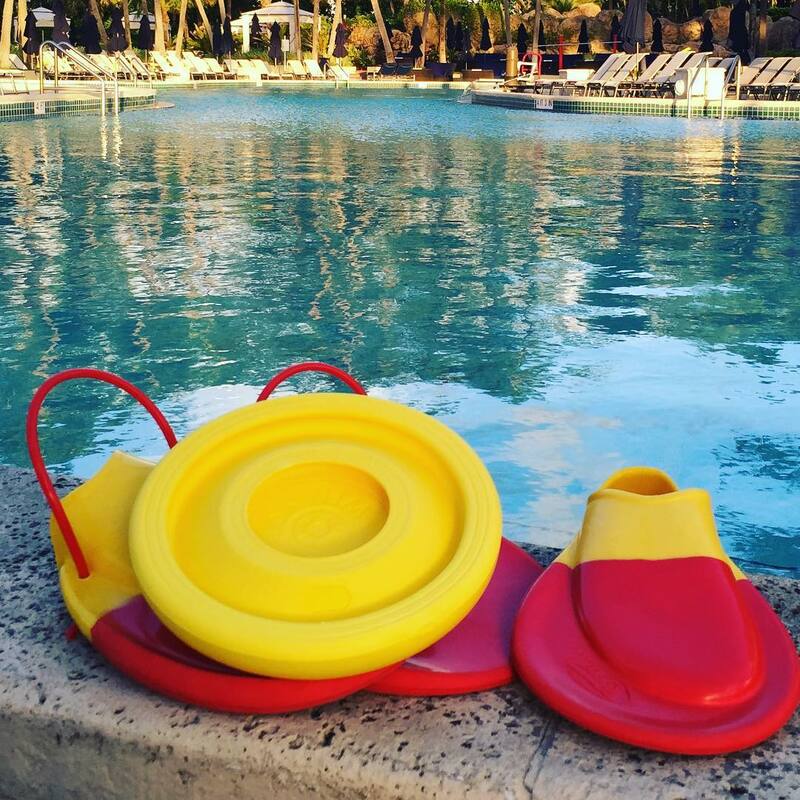 After making your reservation, the next step is to invite your team to come to the pool on the specific date and time. We can assist. Invite letter for sending to various groups (churches, sports teams, camp groups, swim teams, lifeguard staffs, work places, city employees, school communities, teacher groups, etc.). This invite letter directs captains to sign-up so as to reserve their group’s time-and-date for participation via a web site. A RSVP, web-utility gathers the group and captain and player sign-ups. To insure quality interactions, each session is limited to a set number of squads at the pool at any given time. In 2018, for Ammon, we’ll set the pool squads limit to three (3). An online, as well as a paper-based player sign-up form collects photo-release permission, emergency contact info and begins the process of bestowing digital badges for participation records. Boilerplate text to call members to gather is delivered to group captains. Leaders can then deploy these standard details to their circles for easy, clear instructions as to what, why, how, where and when these events take place. The website has a players tip page of what to expect, gives map to Ammon and other links and insights on how to play so that the groups to arrive at the pool ready. Players sign-up to attend on our website, to reserve their spot on their team and can opt into other news and the captains’ emails. Every night, the “House Team,” players from Ammon, and play as the white team. Play again on another night. Take swim lessons at Oliver Bath House in weeks / months to come. 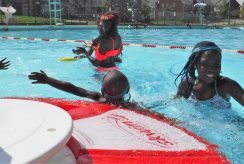 Obtain a Citiparks Pool Tag. Participate in the Saturday Swim School. Watch NCAA water polo on September 1, 2018, at Highland Park Pool. Try Underwater Hockey at a rookie player practice. Swim teams and lifeguard staffs with proven swimmers are invited to play either the community SKWIM games in shallow water or else do Ultimate SKWIM in deeper water on nights when there is not water polo, from 6 to 7:30 pm. These swim teams are with people who are already good swimmers and would happen after their swim season ends. Underwater Hockey Clinic, as a one-time clinic for anyone interested. Just sign up as an individual. A scout group could challenge another group of scouts from another neighborhood. An X-Country team at one school could challenge their school’s volleyball team, or band, or X-Country rivals to a match. A nonprofit neighborhood group could challenge a church group. The local Democratic Committee could issue a challenge all the other committee leaders from around the city. The lifeguard staff at one pool could challenge the lifeguards from another pool. The parents and PTO boosters at one school could challenge the faculty or students at their school to an event. Download and check out the SKWIM App from eLifeguard.com. 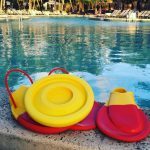 Review swimming techniques with a simple, online course called, Get Your Feet Wet. and outreach can help in recruiting lifeguards. Events should garner interest for participation for other aquatic and athletic programs.